There were heavy showers in the morning, but as ever, Manchester triumphed over climatic adversity, and went on to enjoy a fantastic 12 hour festival of electronic dance music in Castlefield on Saturday. The canal wharves, brick enclosures, bridges, viaducts and renovated buildings of this 200 year old former commercial district echoed all day and all night long to the hypnotic, pulsating and repetitive sound of contemporary dance music. And to round off the evening, fireworks were launched at 11.30 into the now jet black night sky over Castlefield. Suspended from the top of a specially hired crane the D.Percussion logo ignited into a waterfall of sparks and flames. And it was all celebration of that momentous day, nearly 50 years ago, when the first stored program computer in the world, developed by Professors Freddie Williams and Tom Kilburn, was successfully made to run. More coverage of Digital Summer in my Eyewitness@ds98 website, shortly to go live in Manchester Online. 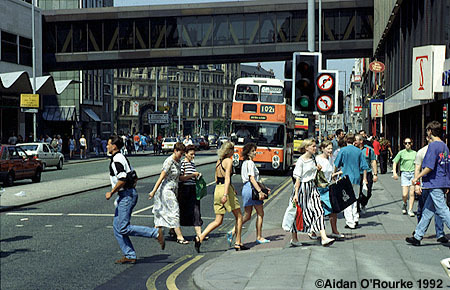 The City Centre streets were quiet this afternoon. In the pubs of the city, groups of office workers crowded around TV screens to watch England's first World Cup match. It was a similar scene in quite a few offices. At first they were subdued, but as England scored, there was cheering and chanting. 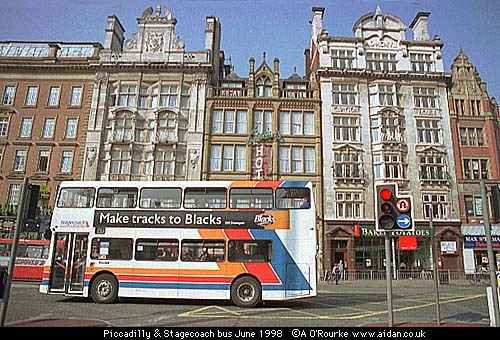 By the end of the match, Oldham Street was being treated to a loud and tuneless rendering of "Football's coming home" by fans who had gathered in Dry 201 bar. Later the chanters made their way home, well-oiled and in high spirits. There was none of the trouble that exploded in Marseilles, though any Tunisians in the city (and there are quite a few, I'm sure) were keeping a low profile. I also met up with Eyewitness in Manchester reader Keith Stokes, originally from Eccles, now resident in the States. We had a half pint in the Vine after the match. So if you're dropping in to Manchester and fancy a pint and a chat, just e-mail me. It's the second anniversary of that terrible day when a terrorist bomb destroyed, in an instant, a large section of our city centre, and threatened the lives of thousands of people. I was in the Gulf at the time, and in the aftermath, craved for news from home. I suppose that's one of the factors that spurred me on to do Eyewitness in Manchester. Now, Mancunians abroad will always be able to keep in touch with home, thanks to these and other websites. And hopefully, Mancunians at home will never again have to endure the nightmare that became reality at 11.13 am on the 15th of June 1996. Today's anniversary was the occasion for the announcement that the Royal Exchange Theatre will soon be returning to its true home inside the old Cotton Exchange on St Anne's Square. Gordon Burns of BBC1's Northwest Tonight visited the Royal Exchange this afternoon, and found many exciting new things: The decor has been completely redesigned, and will be much brighter than before - the theatre structure has been refurbished from top to bottom and has comfortable new seats. At the top, the roof doors will open to allow high level displays above under the dome. It has to be seen to be believed. Pictures to come soon. Subject: A Bigger City of Manchester ? Urghhh! When it comes to cities, bigger is not best. What is being proposed in Manchester is the opposite of what folks here in Los Angeles seem to want. The bigger the city the bigger the beaurocracy that is created to govern it. Take my advice, forget the idea of a Bigger City of Manchester. PS "....welcome back to the Manchester Evening News Arena where..." Arena names should have no more than two syllables in their name. I think it should be the Victoria Arena. Yes I believe that the City of Manchester should incorporate all the mentioned towns. I think that the benefits would outweigh the negatives in the long run... taxes for the few actually city residents should lessen with more to share the burden. There would be a more cohesive whole that would bring "more" to the city, e.g business, cultural events etc. THE BIG STORY on the front page of the Evening News today is a proposal by treasury chiefs in Manchester to expand the city to take in parts of neighbouring boroughs. Heaton Moor, Heaton Norris and Heaton Chapel, Gatley, currently suburbs of Stockport, could be incorporated into a mega-city of Manchester. Sale, Stretford and Old Trafford, could be taken out of Trafford, and Prestwich may move out of Bury. Failsworth might be severed from Oldham. Not surprisingly, councillors in Manchester's neighbouring boroughs are not too happy about the possible loss of part of their towns. Stockport Council leader Fred Ridley (LibDem) said "It's appalling and typical of the attitude of Manchester. If they want a fight, I'm prepared to give it to them." But there is no denying that the division of the Manchester conurbation into ten independent boroughs isn't always beneficial to the region as a whole. And surely it's absurd that although over 3m people live within 10 miles of Manchester City Centre, only 431,000 people live in the City of Manchester itself - a long, narrow area stretching around 14 miles from Heaton Park in the north to the southern perimeters of the Airport in the south. The City of Salford is only a five minute walk from Manchester Town Hall, ratepayers on either side of Upper Chorlton Road pay different council tax amounts - those within the City of Manchester pay more - much more. I once had an irate discussion with a friend from Birmingham about the relative importance of his home city and mine. Birmingham, with just over a million, is more than double the size of the City of Manchester, though the Manchester conurbation has a bigger population than the West Midlands. Birmingham, like London, Berlin, New York, Tokyo and many other cities, incorporated a substantial part of surrounding areas many years ago. For various reasons, this didn't happen here and the present day boundaries are an accident of history. Rather than Manchester eating into parts of surrounding authorities, I think a "confederation" of the ten boroughs, with a unified council tax, would be better. There's already co-operation with fire, police, waste services, the airport, and the Mersey Valley. Why not build on these co-operative arrangements, for the common good? THE NYNEX ARENA is to be renamed the Manchester Evening News Arena. This is to happen once a new sponsorship deal goes ahead. 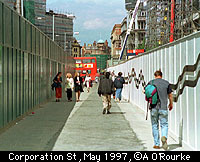 Manchester's newest sports and music arena was topped out in 1994 by Mick Hucknall, and cost �56m. Some of the famous names who have played there - in different senses of the word - are Simply Red, the Manchester Giants, Take That, Manchester Storm, plus a long list of others. The telecommunications company Nynex was recently taken over by Cable & Wireless, so the Nynex name now officially belongs to the past. I first became aware of the Nynex arena when, after returning home after four years abroad, I noticed a large beige structure on what used to be part of Victoria Station. Four years previously, the wooden platforms and Victorian ladies waiting room were still there. 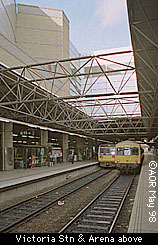 Now, a futuristic complex, complete with giant arena, and multiplex cinema sits atop the rear part of the station. IT'S THE LORD MAYOR'S PARADE tomorrow - it will be making its way through the city centre probably early afternooon. The theme this year is "Celebrating Manchester - A Truly International City". Another big event is the D.Percussion festival in Castlefield, going on from 12 noon to 12 midnight. There will be a cacophony of music on various stages around Castlefield, culminating in a firework display at midnight. It's the first of many events in Digital Summer 1998, ds98 commemorating the 'Birth of the Baby', which if you haven't heard, was the first stored program computer - developed at Manchester University 50 years ago. An "Eyewitness@ds98" website, by yours truly, covering the events of the summer, will go online on Monday, part of Manchester Online. IT WAS HOT & SUNNY today, just like in the picture at the top, and not a drop of rain! This is thanks to a large area of high pressure over the country. But as the Granada weather is announcing at this moment, "cloud & rain are about to push in from the south, with temperatures of 59/15 celsius tomorrow". The current EWM temperature is 51/11. It's going to be cloudy and overcast over the weekend, but hopefully not as rainy as at Woodford last Saturday, when the photo below was taken. It went from "danger of sunburn" to "danger of drowning" in the space of about twenty minutes. Let's hope the weather forecast for the weekend is wrong! This afternoon, people in Manchester city centre were sitting in pubs, watching TV screens, or sitting in cars with the radio on, all following the World Cup. Some pubs are geared up for the World Cup, providing giant screens, others are offering football-free zones. But wherever you are, there's no getting away from it, and especially not in Manchester, the home of football! Paintings and drawings by Salford artist LS Lowry were auctioned at Sotheby's in London today. His painting of Piccadilly Circus was sold for �562,000, around twice as much as expected. �386,000 was the previous record for one of his paintings. LS Lowry was in the past considered to be too "Northern" to be considered a great artist, but that's certainly changed. But it was a painting of London, one of only a few he did of the capital, that fetched the biggest price. BBC1's Northwest Tonight featured the Lowry sale, and showed an interview with Steven Hetherington, Chief Executive of the Lowry Centre. He described Lowry as a major artist of the 20th century, and Britain's most popular artist. Work proceeds on the Lowry Centre, a futuristic Arts centre & theatre, located next to the Ship Canal in the middle of Salford Quays. A footbridge to the Trafford side of the water will be floated into place in a month's time. Salford Museum & Art Gallery, situated next to the University, has a large collection of his work, which will be displayed at the Lowry Centre when it opens. When I left the house around noon today, it was sunny, but by the time I'd got into Manchester, it was pouring rain. Half an hour later, it was bright & sunny with blue skies and white clouds. 30 minutes after that, there was a downpour. Earlier this evening it was dry, but soon after, it started raining again. Right now it's a wet, grey evening, still light even though it's nearly ten o'clock. EWM temperature 52/11 degrees. After a huge amount of preparation and some technical difficulties, the new and improved Eyewitness in Manchester website, comprising over 1000 files, finally goes live. The archive photographs (examples above) have been completely re-organised, and should now be more easily accessible. New photos appearing on the Eyewitness in Manchester newsletter page will immediately become part of the Image Collection, which also contains a QTVR panorama section. Manchester People will feature pictures, bio-details and interviews with all kinds of Manchester People. More features will follow in due course. The newsletter page will be updated at least twice a week, providing, as ever, an alternative, individual and uniquly photographic view on Manchester. I have also been commissioned to do some additional feature websites for Manchester Online - the first of these will be focus on Digital Summer - celebrating the 50th anniversary of the first stored program computer. 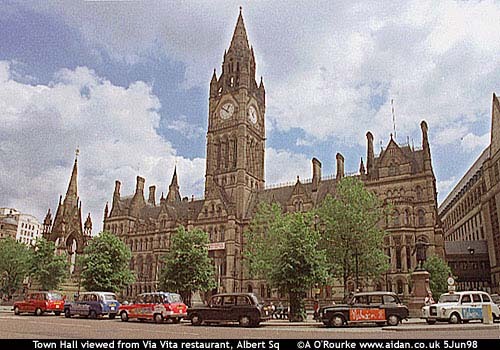 This website is already in preparation, and will contain lots of photos and reports about how Manchester is celebrating the "Birth of the Baby". Finally I'd like to apologise once more for recent delays. Eyewitness in Manchester is back, and hopefully better than ever. Please start sending me those e-mails again - I've missed them! This was the scene at Old Trafford yesterday - another day of continuous rain over Manchester. The gloomy weather is being caused by a large area of low pressure to the west and a series of cold fronts moving east over the UK. 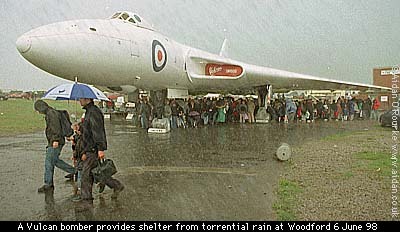 On Saturday the Woodford Air show started with heavy showers, then bright sunshine, then torrential rain. Pictures coming soon! Aidan, Dave Crompton calling again from Montreal. Well, how about this? 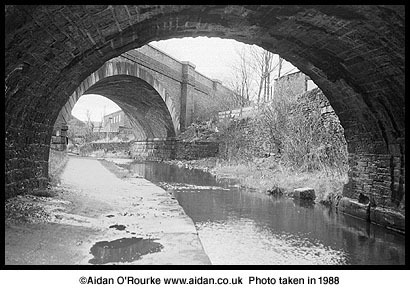 I took it in Tameside a long time ago, but I'm not sure where. Any ideas?